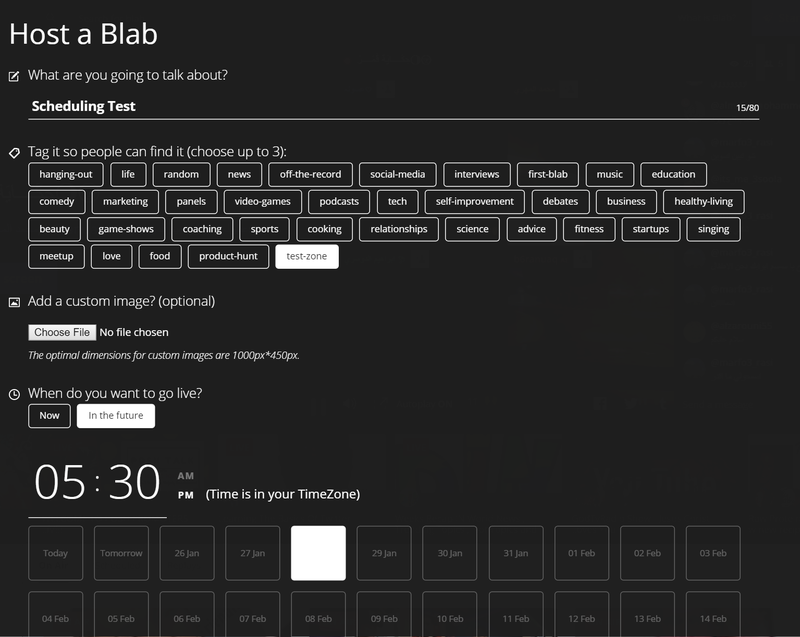 Blab is focused on conversation. 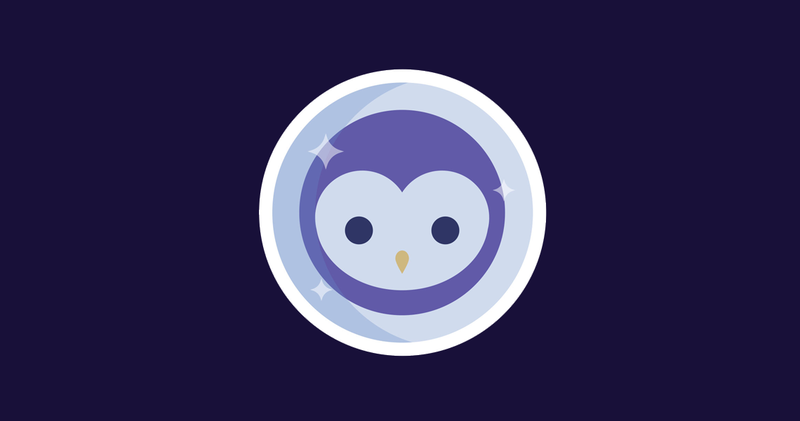 While you can host a solo Blab, that’s really not using the platform effectively. 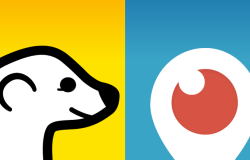 If you just want to livestream your walk around town, Periscope is likely a better option. Want to get people together to talk about the best books you’ve read recently? Or maybe get developers on an international team together to talk about the newest release in a convo with fans? Blab is a fantastic choice! This is one of my favorite parts of Blab. While you can go live at any time if you want to have a casual convo, the real power of Blab is in scheduling. This allows you to pick a time in the future, set up your Blab session, and rally people to attend in advance. This is great for building excitement around your upcoming session, and provides more opportunities for pre-promotion. Viewers can even RSVP for your event, which sends them a notification when you go live! 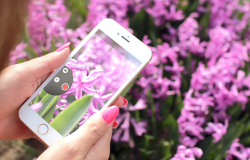 If you choose to record your session, Blab will not only keep that session up on your public profile, but send you links to download the content. 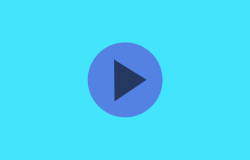 This allows you to quickly upload your session to YouTube, or download for your own usage. They allow you the option of full video & audio, or audio only. There’s a lot of flexibility and potential for developing more bite-sized pieces of content that can shared across your other channels. Have a special guest that says something really poignant? Pull out that video clip and upload it to Facebook or Twitter, tagging in the guest to share with their followers! Up to 3 Guests (+you, the host! 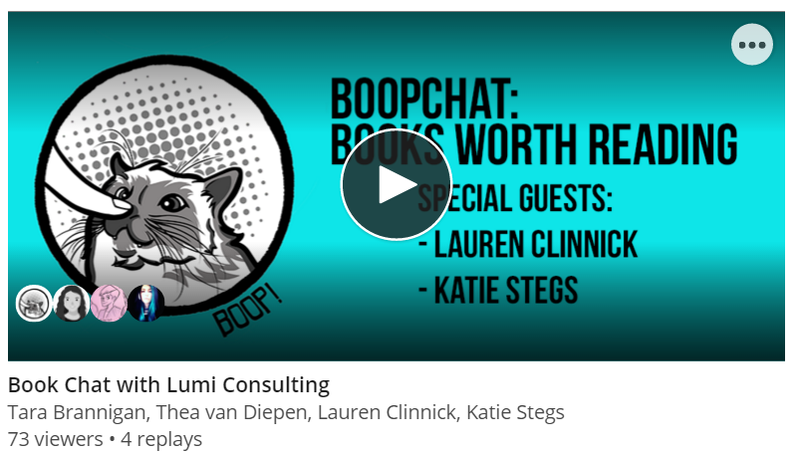 ): In the example below, I was scheduled to talk about books with Lauren & Katie from Lumi Consulting. Near the end of our session, we opened up the additional guest slots to our audience to call in. We were joined by the wonderful Michelle Flamm and Thea Van Diepen (author)! Special Guests: Provided you have an available seat, anyone watching your Blab may request to Call In. Props: Props are happy little upvotes you can give speakers on Blab. Like something someone has said? Mad props, yo. Q&A: Viewers of your session may easily ask questions in chat by using the command /Q. This adds an official question to your Q&A panel on the left hand side of the host view. If you have an extra slot available, clicking the answer button will display the question for everyone to see in the video view. Follow: If someone likes your session, they can follow you and be notified any time you go on air. With time, you can build a big following of regular viewers! Using Blab is pretty straight-forward once you get used to the interface. However, not everything is perfect, and following are a few of the more frustrating pitfalls of the platform. For the next session I’ll be putting a Post-It note on the left side of my monitor to remind myself. It’s really easy to kick off the conversation, get distracted, and forget to click that button. Don’t lose awesome content, make sure to hit record! 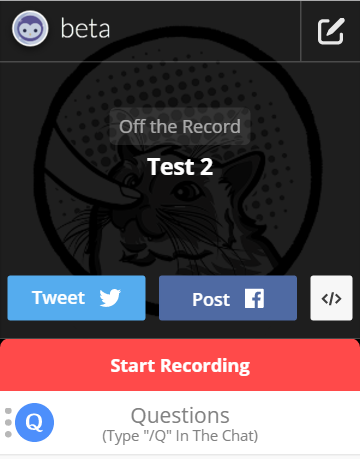 If you or your guests are intending to access Blab via desktop, try to arrange a test session prior to your actual broadcast. I definitely suggest using the desktop view as a host, but it can be a little finicky. You’ll want to make sure that your guests allow the browser the right permissions, and that it picks up the correct camera & mic. The latter is really easy to miss, and not exactly intuitive to fix. 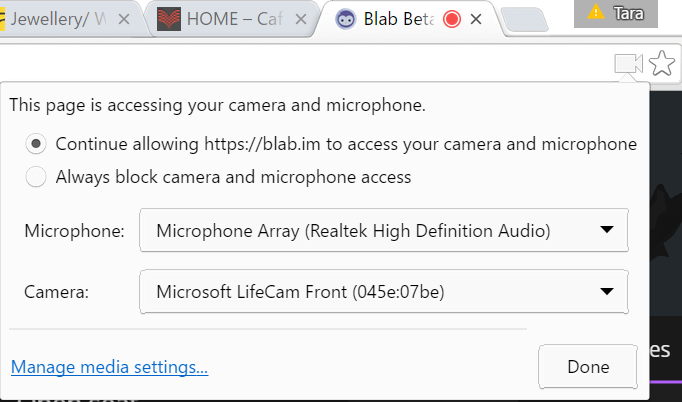 From here you should be able to adjust the mic & camera that Blab is attempting to use. If you’re having audio issues, this is almost always the problem. There’s less of a problem with this than I’d expected, but it’s still worth noting. Be prepared for your guest’s bandwidth to be less than ideal, pop in and out, or otherwise be a fickle jerk (the bandwidth… hopefully not the guest). The audience is pretty forgiving, but just make sure you’re not reverting to dead air and fish-eyed staring when your guests disappear. That’s why it’s so important to make sure you always have something to say on the topic you’ve chosen. Be prepared to carry the session on your own, if that what it takes! One of my favorite part of conferences is attending panels with great speakers. What is a panel? A couple of speakers discussing a core topic. Why not carry this same format into Blab? Start with a topic, find some great speakers that are willing to join, and schedule that puppy in! It helps to have some questions planned in advance, but don’t feel too constrained to stick to a script. Have fun with it, make sure you involve the audience, and watch the time fly by! By that I mean any sort of regularly recurring, conversation driven meetup. It doesn’t have to be about books! 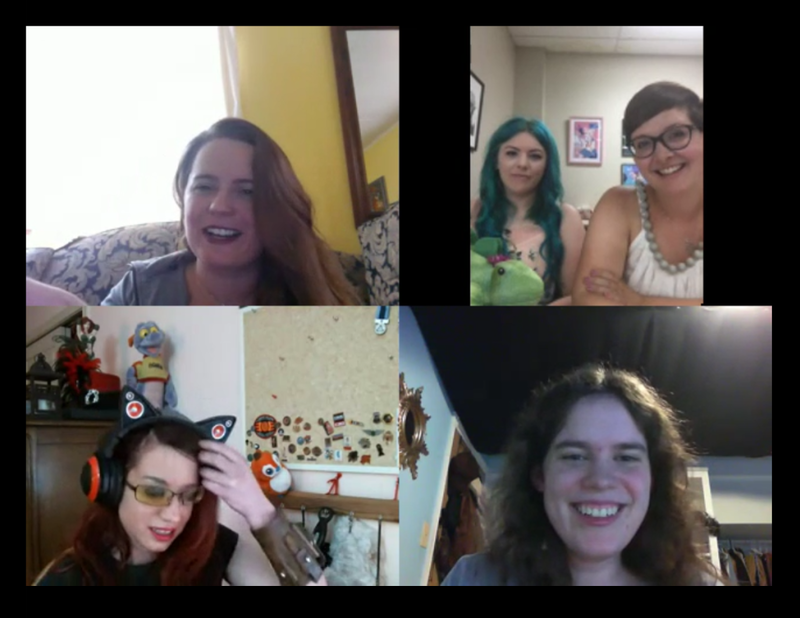 If you’re okay with other people joining in, using Blab for your regular get-together can be a great option! Set it up, schedule the sessions regularly, and get people interested in joining in on your discussion! It really doesn’t matter what the topic is, there is almost certainly an audience out there that would like to join you. Being able to connect with your community is critical to building great relationships. What better way to connect than by sharing the love and inviting them into the conversation? Celebrating a big new release with your team? Schedule a Blab session with some of the people who made it possible, and invite your community actively participate. Have a super community member that’s gone above and beyond in helping share the love around your launch? Invite them to call into chat with your team so you can say thank you in a more personal way! Note: Just be wary and exercise good caution here. Someone acts like a troll 99% of the time? Maaaaybe not the best person to put on a live broadcast. Use your head, reward great community members, and have fun! Questions? Comments? Suggestion for a Blab session? Drop me a line in the comments or @boopsocial!